If you are having new wiring installed for your home or office, you will likely need to add a switch to accompany your electrical system. As simple as this may seem, we strongly encourage you to let one of our trained electricians handle the job. The risk of electrical shock to an untrained individual is high and simply isn’t worth it. 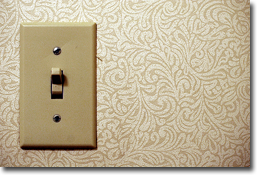 One of the common calls we receive from clients is a request to have a light switch or electrical outlet moved. If a switch was installed in an inconvenient location during construction, or a remodel has forced you to consider moving an outlet, we can assist you. We will install the new switch and patch up the wall where the old switch was removed. During the process of installing a new switch, you will want to decide whether to go with a traditional or a dimmer switch. The range of lighting you receive from a dimmer switch is dynamically improved. Having guests over for a celebratory dinner? Bring the dimmer to a lower setting to create an intimate evening. You are able to easily change the look and feel of a room simply by using this lighting option.